(Scarborough, Ont.) 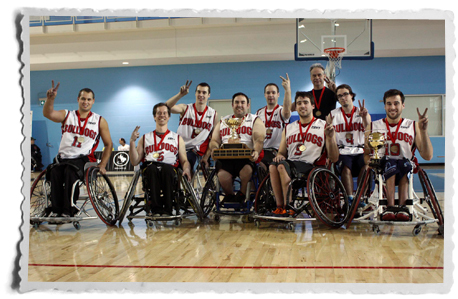 The Bulldogs de Quebec asserted themselves as the best wheelchair basketball club team in Canada by capping off a dominant performance at the 2015 Canadian Wheelchair Basketball National Championship with a 58-55 gold medal victory over their provincial rivals the Gladiateurs de Laval Sunday at the Toronto Pan Am Sport Centre. David Eng of the Gladiateurs was named the tournament’s most valuable player. Maxime Poulin of the Bulldogs, Adam Lancia of Variety Village, Bo Hedges of the Academy, Rosalie Lalonde of the Gladiateurs, and Abdi Dini of Variety Village were named to the all-star team. With the win the Bulldogs conclude the tournament with a flawless 5-0 record and extend their undefeated streak to 10 games dating back to 2014. It was the third consecutive time these two teams have met in the final. “It’s a pretty intense rivalry. We play all year long against each other. We lost to them this year in the provincial final and we won again this year at nationals. The rivalry is there and I think it’s always a good match up against the Gladiateurs,” said Bulldogs sharpshooter Maxime Poulin. The Bulldogs held the lead for most of the game on the strength of Poulin’s accurate shooting and game-high 26 points. The Gladiateurs responded with Eng showing off his range and scoring five three-pointers on route to a team-high 25-point performance. The score remained close throughout the four quarters with the Bulldogs holding a modest 31-27 lead at halftime. Things got interesting in the third quarter when the Gladiateurs began to mount a comeback. Eng hit consecutive baskets from beyond the arch to help Laval take a 41-39 lead heading into the final frame. Not to be outdone, Quebec demonstrated gritty resilience by clawing its way back in fourth quarter. Consecutive free throw attempts by Poulin tied the game up at 47-47 with five minutes to play. He followed up with back-to-back baskets from the left baseline to restore the Bulldogs lead 51-48. Eng responded with a three-pointer at the two-and-a-half minute mark to narrow the Laval deficit to two points. A few plays later with the game winding down and the ball in his hand, he hit yet another long bomb to once again to deadlock the score at 55-55. With less than 10 seconds to go Poulin drove the basket and found a way to finish despite having two defenders blocking his way. His basket moved the Bulldogs back into the lead 57-55. Teammate Mickael Poulin iced the possibility of a comeback and sealed the victory for the Bulldogs by getting a hand on an inbound pass to force a turnover with just 7.5 seconds remaining. Maxime Poulin would cap off the scoring with a free throw. Powered by Lancia’s juggernaut 48-point performance, Variety Village needed two extra quarters of overtime to come out on top of a closely contested seesaw battle with the Academy that ended 84-81. With a number of players on both teams hitting their offensive stride the game required nearly 10 extra minutes of play to reach a conclusion. The teams exchanged leads throughout the game, but the action really started heating up halfway through the fourth quarter when Hedges drained a long three-pointer just as the shot clock expired to bring the Academy within a point, 55-54. Moments later an errant pass by Variety Village led to a Zak Madell reverse layup that gave the Academy the temporary lead. Dini responded for Variety Village by quickly turning the ball up court and sending Tim Bourne, fresh off the bench, on a breakaway. Bourne easily deposited the uncontested layup. Then with just over a minute to go Lancia used his long reach to arch a sweet hook shot straight into the net and Variety Village found themselves up 64-62. The lead wouldn’t last long though, and with the score knotted at 64-64, the Academy turned to Madell to hit four straight layups in the extra frame and secure a four-point cushion. Lancia once again found ways to power his way to the basket and thanks to back-to-back swooshes, Variety Village was back within striking distance. With just under a minute remaining in the first overtime the score was 73-71 for the Academy. In a familiar sequence of events, it was yet another fast break by Variety Village that forced the game back into a tie. On this occasion it was Dini who was sprung free and the clock read 6.8 seconds when he kissed the ball off the glass to make the score 75-75 and force the second overtime. The Variety Village defense managed to get four stops in a row to start the sixth quarter before forcing a turnover and sending Jesse McNalley in for two of his 20 points on the day. Lancia stretched the lead to 83-77 with a left-handed layup. Then with just 21.1 seconds on the clock Madell forced his way into the key and hit a difficult basket, while drawing a foul, for two of his team-high 28 points. Then with his team trailing 83-81 he intentionally missed his free throw and got the possession back for the Academy. With the pressure on Variety Village managed to hold firm and prevent any more damage. A free-throw attempt by Dini in the game’s dying moments secured the victory 84-81. Variety Village finishes the tournament with a 4-1 record and makes their first trip back to the podium since winning back-to-back tournaments in 2011 and 2012, while the Academy wrapped up with a 2-2 record. “They had some guys that were on fire so we definitely had to change our game plan throughout the game in order to adjust our coverage and luckily our offense was clicking too and it paid off in the end. We’re definitely happy to improve from last year and get back on the podium,” said McNalley.